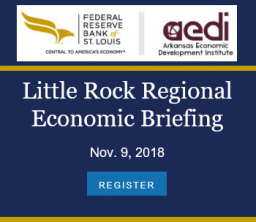 The employment report for August featured yet another drop in Arkansas’ unemployment rate – down from 3.7% to 3.6%. That matches the historic low for the series last seen in May of 2017. The lower rate was driven by substantial declines in the reported number of unemployed over the past two months: The number of unemployed in August was down by over 1,400 following a decline of about 1,300 in July. Over the most recent four months, the number unemployed has fallen by over 3,500. Meanwhile, the household survey is also showing persistent declines in the number of employed: Over the past 12 months there have been only two modest increases in employment, with a cumulative decline of 8,600. 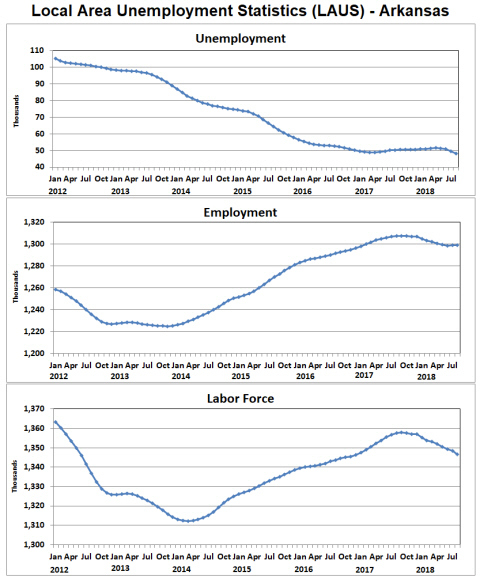 As a result of these two trends, the labor force (employed plus unemployed) has also been moving lower over the past year. 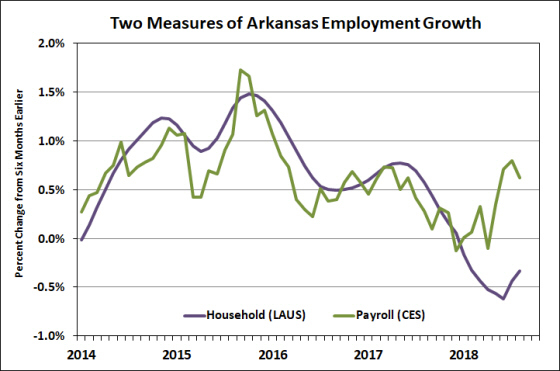 The data on nonfarm payroll employment in Arkansas showed a slight decline August – down 900 jobs from July (seasonally adjusted). 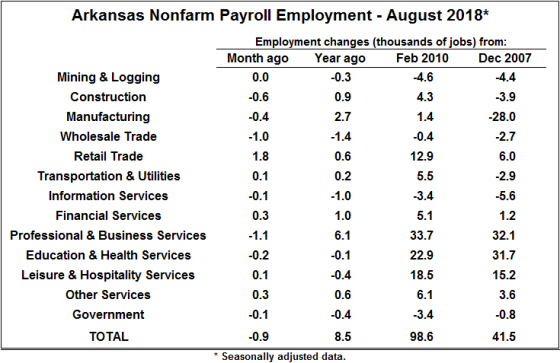 The July total was also revised downward by 600 jobs compared to the report issued last month. Monthly declines were distributed across many sectors, including some that have been showing notable growth in recent months. Professional and Business services, which have increased by 6,100 jobs over the past year showed one-month a decline of 1,100 in August. Both Construction and Manufacturing employment were also down for the month after having previously shown some welcome signs of growth. One bright spot was Retail Trade, where 1,800 net new jobs were reported. Over the past twelve months, total nonfarm payroll employment has expanded by 8,500 jobs — an increase of about 0.7%. In our analysis of the June report, we noted that the household and payroll surveys were appearing to diverge. The discrepancy continues to hold: In the six months ending in August, the payroll report shows an increase of 0.6% while the household survey shows a 0.3% decline. Of the two measures, the payroll survey is generally considered to be more accurate, although both will be subject to revision early next year. Preliminary data from a third source of information on employment trends, the Quarterly Census of Employment and Wages, tends to support the indication from the payroll survey: somewhat slow but positive employment growth.